Filmmaker Casey Neistat made a little documentary for the New York Times about Mayor Bloomberg's infamous soda ban, which, Neistat explains, doesn't really ban as much as people who are super-covetous of their freedom to drink as much liquified sugar in a single gulp seem to think. 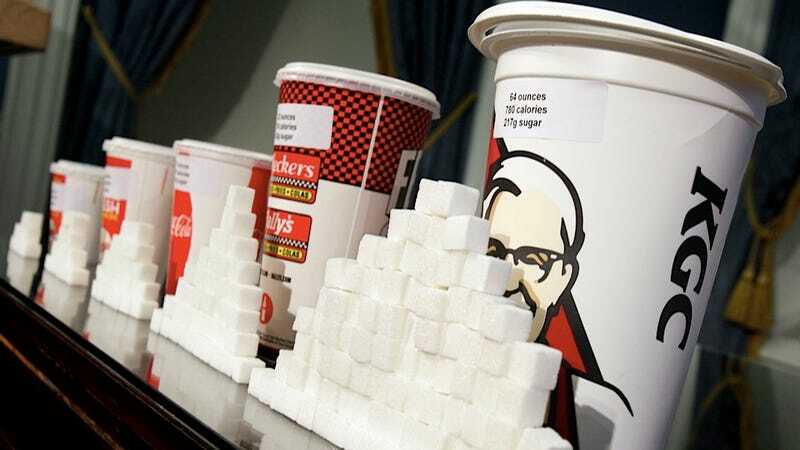 To start - the proposed ban on large, sugary drinks isn't really a ban on anything. Even if the New York City Board of Health passes the ban this coming Thursday, 7-Eleven, the ubiquitous convenience-store chain, will still be able to serve its 50-ounce Orange Explosion Slurpee, which contains 107 grams of sugar, the equivalent of nearly four full-size Snickers bars. Dunkin' Donuts could still sell its large Vanilla Bean Coolatta (174 grams of sugar, or nearly six Snickers bars, in its 32 ounces). And if you can find a place with unlimited refills, you can still drink as much soda as you like. Not just that, but the ban has nothing at all to do with alcoholic drinks, "fruit" drinks or diet soda. Iced coffee and other drinks that let customers choose their own sugar adventure are still free of Bloomberg's regulatory iron grip — there simply won't be any more 20 oz. refreshing sugar pools waiting for people to dive straw-first into at the end of a long line at McDonald's. If New Yorkers reduced portion size to 16 ounces from 20 ounces for one sugary drink every two weeks, it would collectively save approximately 2.3 million pounds over one year. This proposal could be the catalyst the city needs. It's hard not to see the logic in Neistat's argument — his documentary is jaunty and his supplementary op-ed piece is concise and cogent. He discusses obesity as a public health problem without really shaming people who are overweight, but people get awfully defensive when their personal freedom — or the personal freedom they think they have — is threatened. Even though it happens to everyone everyday, nobody wants to be told a) what to do, and b) that they're wrong. So, sensible as Neistat's op-ed may be, for anyone who's riled up by Bloomberg's ban, any contrary opinion most likely creates a does-not-compute situation. Hooray for dialogue!